In a DRSSTC (or indeed, any Tesla coil), correctly tuning the coil can mean a factor of two or more difference in spark length. Furthermore, finding the correct tuning point can significantly reduce transistor heating and power consumption, while improving general reliability and fault-tolerance. This article describes some tips and tricks on finding the best tuning point for a Tesla coil. For single-resonant SSTC builders, the preferred driver is one which locks on to the resonant frequency of the secondary. Because the inverter resonates with the secondary LC network (reflected through the primary), this also ensures zero-current switching in the primary. This eliminates any need for tuning. However, secondary feedback should NEVER be used for a DRSSTC, as any deviation between the resonant frequencies of the primary and secondary will cause the inverter to fail. Always use JavaTC or another simulator to design the primary and secondary assembly first before doing any construction - a randomly selected primary will probably not work (of course, you could get lucky, but this is about as likely as beating Russia at war during the Arctic winter). The secondary should be designed to have a resonant frequency slightly higher (to often quoted as "10%", but this is fairly arbitrary) than the primary. Matching the primary and secondary exactly will reduce performance, as the streamer load drops the secondary frequency, preventing further energy transfer. It also loads down the primary and prevents further resonant rise across the primary. The secondary resonant frequncy can be obtained by using a function generator to pass a sine wave through one end of the secondary assembly. By keeping one end of the secondary floating, the entire secondary assembly acts as an antenna, radiating an electric field. 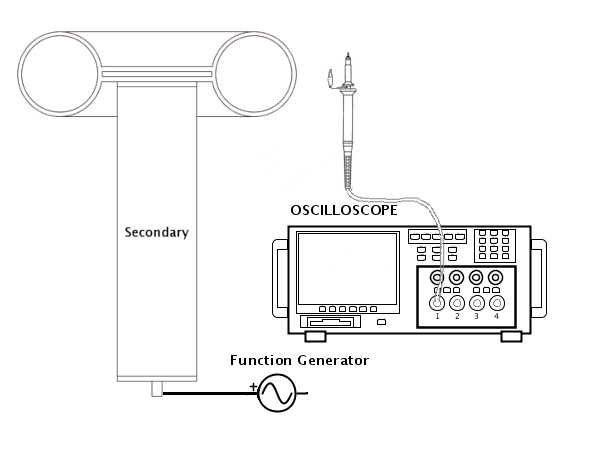 The E-field can then be measured using an oscilloscope and a floating probe. Adjust the frequency of the sine until the maximum amplitude is found; use simulation results to get a starting point for the resonant frequency. Note that several "peaks" may be found during the tuning process. These are simply the harmonics of the secondary and should be ignored. It's also important to keep the scope probe stationary as the distance from the secondary affects the amplitude.